At Clean Lakes Alliance, we often get questions related to water levels in the Yahara lakes. Here we take a brief look at the Yahara dam system, who controls the lake levels, and how water levels can affect our ability to use the lakes. Who controls water levels in the Yahara lakes? The Dane County Land and Water Resources Department is in charge of maintaining appropriate water levels in the Yahara lakes. Acceptable water levels for each lake are determined by a specific Wisconsin Department of Natural Resources mandate as summarized in the table below, measured in feet above sea level. For more information, visit the Land and Water Resources lake level management page. How are the lake levels maintained? Lake and river levels in the Yahara Watershed are maintained through a comprehensive system of dams and locks. 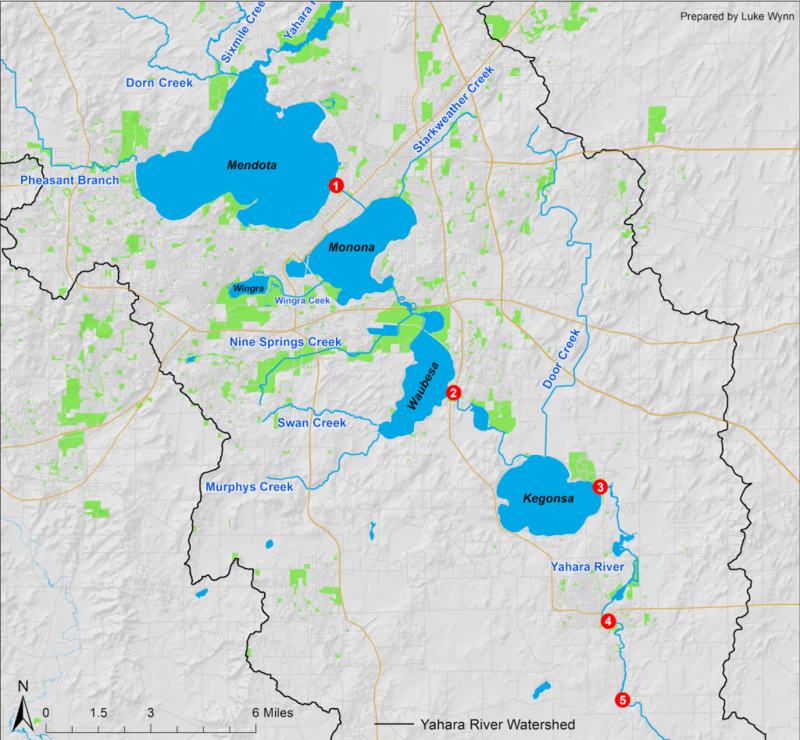 There are currently five functioning dams in the Yahara Watershed. The Tenney Park Locks, represents the northernmost and primary dam used to manage Yahara water levels. The Tenney Park Locks were initially constructed in 1847 as part of a flour mill. They were purchased by the City of Madison in 1896 and transferred to the ownership of Dane County in 1980. The Dane County Land and Water Resources Department uses the dams to manage water flow when lake levels exceed or drop below their respective target maximums and minimums. Since Lake Mendota is the northernmost lake in the Yahara system, its level directly influences water flow into the rest of the watershed. When levels are too high the Land and Water Resources Department operates the Tenney Park Dam to minimize flow from Mendota into Monona and Waubesa. The goal is to minimize the potential flooding impacts of Lake Monona on public infrastructure. The Babcock and LaFollette Dams are opened during this time to allow for maximum flow out of Monona and Waubesa and into the Yahara River. When levels are too low all dams are opened as needed to maximize flow. Flow throughout the watershed is primarily controlled through the Tenney Park Dam. What are the slow-no-wake rules as they relate to water levels? Dane County maintains a slow-no-wake zone within 200 feet of the shoreline of each of the four Yahara lakes. The one exception to this rule applies to the portion of Lake Monona running from Law Park to 1,000 feet north of where John Nolen Dr. intersects Lakeside St, where the Mad-City Ski Team practices and performs shows. The Town of Madison maintains a slow-no-wake ordinance for the entire portion of Lake Wingra at all times. In addition, the motorized operation of boats is prohibited on Saturdays, Sundays, and holidays. On days when motorboats are permitted, they must not exceed the slow-no-wake speed of five miles per hour. High lake levels can cause the slow-no-wake ordinances to be expanded to a 500 foot distance from the shoreline, and even to the entire portion of the lake. For further information and live updates on current slow-no-wake ordinances, visit the Land and Water Resources Department’s slow no wake page.